Teenage Engineering, a large electronics company based out of Sweden, continues to amaze us by sending us some of the coolest boredom killers around. For starters, the most popular of their products is the OP-1 Synthesizer , a small synth, drum machine, vocoder, and pretty much everything under the sun. It’s honestly one of the best, most unique and popular instruments to be ever released and is still being used by a ton of people in 2015. It’s very compact and easy to carry around as well, which makes it perfect for a portable music studio. You will be making music in bed, school, at the park, in the train/plane, at your desk during a work break, etc. You’ll find yourself using this thing for hours without having to charge, the battery life is amazing. The OP-1 offers tons of great sequencing pre-sets for drums and the synth tracks. It even creates melodies for the synth based on your drum tracks and vise versa. After creating sequences, they can be recorded to the 4-track recorder. They can also easily be cut, pasted, rearranged, reversed, etc. You can also add live after effects once you have fully finished your track. The sampling capability is also both unique and excellent. Sampled sounds from the microphone, the line input, the built-in radio or even the device itself, can be used as sounds or as modifiers to other sounds. Building sequences with sampled sounds is as easy as using any other software on a home computer. The OP-1 is perfect for those tracks you make up in your head mid-day and have nowhere to put them and lose the idea by the time you get home. It’s basically a notepad for producers. Easy to use for beginners, and can even be brought home for the studio. The possibilities are literally limitless with the OP-1 with one of the best onboard softwares I’ve ever seen on a piece of equipment. The LED graphics are easy to read, minimilist, responsive, and welcoming. One of the best things I have ever bought hands down. Just plug it into your stereo and start jamming. 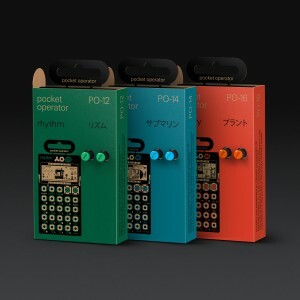 Also check out the PO-12 (or any of the pocket operator series) this cool little pocket synth is as big as a calculator but can do what most 100lb analog synth were doing in the 80’s! Possibly the most fun you’ll have with a “toy” drum machine. Anyone can pick this thing up and start making interesting sounds and having fun with beats and effects. Those of us who are experienced with drum machines and computer music can unlock the real power of this baby; any genre is possible and you can get mad deep into complex patterns and sounds. I use this with my mini-rig setup but it is a seriously wonderful musical tool on its own, too.